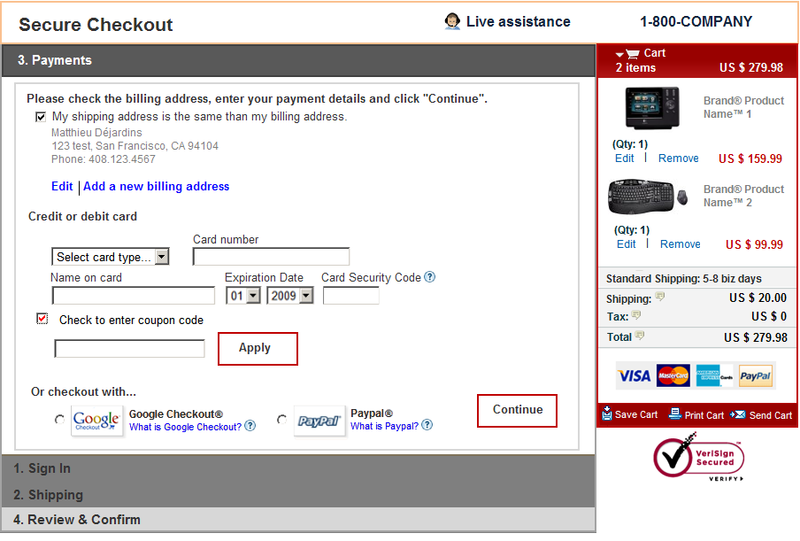 Checkout Process Usability wireframes: prevent the shopping cart abandonment by applying the best practices. 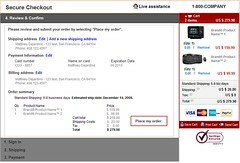 As identified in a previous post, there are around 20 possible reasons for shopping cart abandonment and 12 tips to minimize the drop-off spots in your checkout process. 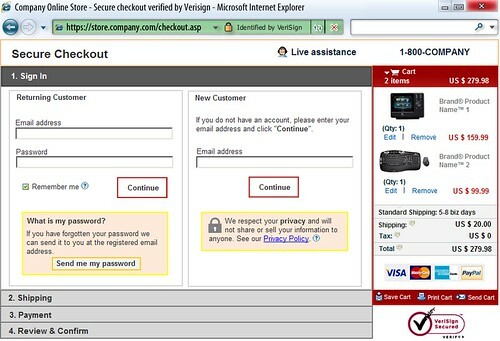 To facilitate the comprehension of these critical principles, I have designed wire-frames with step-by-step explanations on how to enhance your checkout flow and increase the completion rate of your online orders. Landing Page Optimization: what should you test? You can run only a limited number of tests on your landing pages. Moreover, as recently mentioned by Tim Ash, you have hidden costs associated to testing: time spend, efforts to set up/measure the test, negative results (short/long term). So, this post will detail which key topics to monitor within your web analytics program or webmaster tools and the steps to take in order to fix what is obviously broken. 1) Scrolling behavior: for example, how much of a page is actually seen by a visitor? According to a recent study published by Jakob Nielsen, Web users spend 80% of their time looking at information above the page fold. Although users do scroll, they allocate only 20% of their attention below the fold. Per his conclusion, the implications are clear: the material which is the most important for the users’ goals or your business goals should be above the fold. 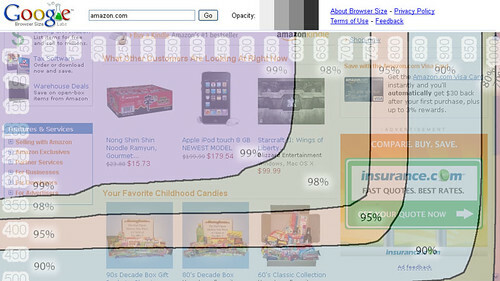 Users do look below the fold, but not nearly as much as they look above the fold. Google Browser Size is a visual tool to determine what percentage of visitors can see the various areas of your website without needing to scroll. Additionally to your web metrics system, Google Browser Size, will give you the opportunity to visualize what portion of users can see a given spot on your own website without scrolling (see the image above). 2) Eye tracking: even if your web designer might think that you will ask to compromise on his landing page, understanding how prospects will process visual elements (and in which order) is essential. As pointed out in a previous post about usability, you can use the “attention heatmap” (predictive technology vastly promoted by Fen-Gui and AttentionWizard) or look at the “click density heat map report” (aggregating click tracking method offered by Google Analytics or by specialists like CrazyEgg, ClickTale or Pagealizer). 3) Path Analysis/link analysis: on average, consumers visit 2.5 Web sites prior to making online purchases, and 42% visit 3 or more sites during their research process (according to a Jupiter Research from April 2008). It is critical for you to apprehend how people are moving through the landing page if multiple exploration paths are possible. 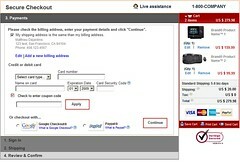 Additionally, are they looking to your “About Us” footer link prior to entering the checkout process (indicating a credibility problem)? Are they visiting the “More info” link (demonstrating that your product is complex and/or you might not have all the relevant arguments in your original landing page)? Google Site Performance tool is one of the resources that webmasters should use to evaluate their site speed which is now a new ranking factor for Google's Search Engine. 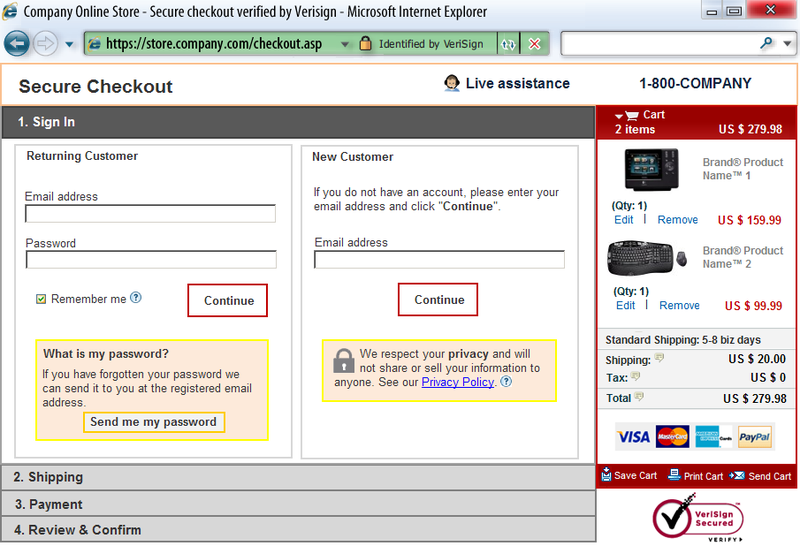 Other options are offered by Pagespeed Firefox add-on or Yahoo! 's YSlow. 4) Page loading time: as it is now official that Google is cautioning the site speed as a new ranking factor, you should make sure that both your SEO & lead generation landing pages are not taking ages to load. No, I am not a Google Evangelist (you have alternatives: Yahoo! with Yslow or Pagespeed, an open-source Firefox Add-on), but, a very effective solution is the Google Site performance in your webmaster tools. As you can see on the picture above, Google is measuring this data since November 2009 when Matt Cutts officially pre-announced at Pubcon that this will be a new factor roll-up for Google’s Search Engine. It is a logical decision for a Search Engine. Moreover, the load time of your landing pages was already specified as part of guidelines for the navigability components to determine the Quality score of Google Adwords. 5) Field and form analysis: observing at how your prospects are filling out forms (e.g. newsletter, registration). For example, what fields get completed first, what last, which field is causing errors (maybe you should provide more contextual explanation) and when do visitors abandon the form? 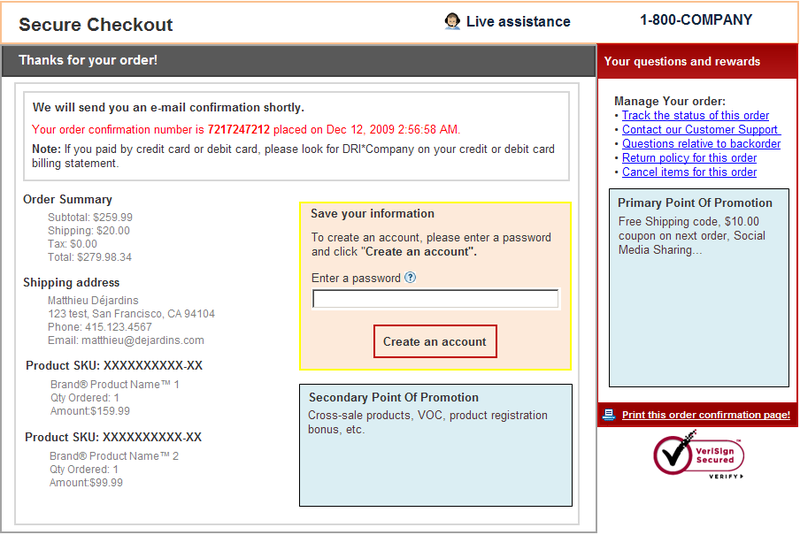 This is crucial to improve lead generation capture or increase your shopping cart completions. A) Clarify and simplify: can you reduce extra or overly verbose copy? Can you remove graphics or navigational elements unrelated to the conversion? 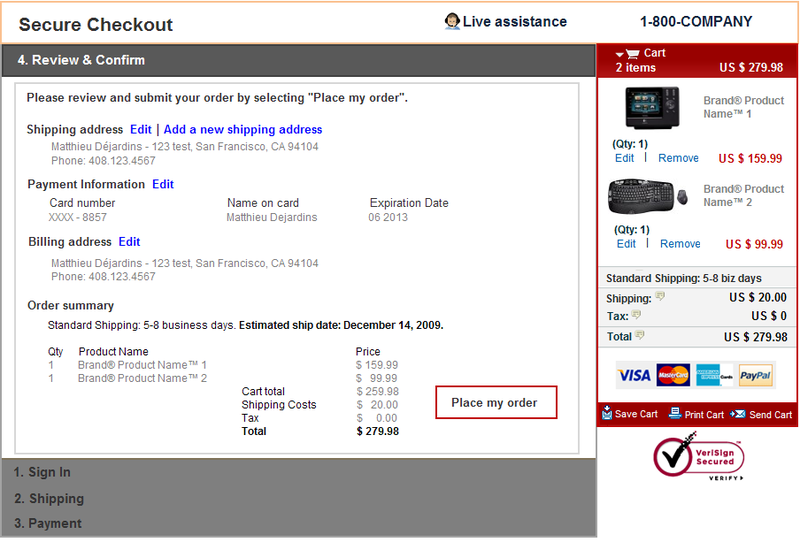 Can you increase the size of your call to action buttons? Can you remove several form fields? B) Tweak your wording for headline, caption and call to action button: can you have a specific headline linked to your ad group (or email message incentive or affiliate’s value proposition)? Can you rephrase the captions under your hero shot? 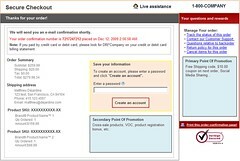 Can you challenge your call to action button with various declinations: “Shop Now”, “Buy Now”, “Add to Cart”, “Get It Now”? C) Play with your graphic elements: do pictures of people (e.g. lifestyle) favorably impact your sales? 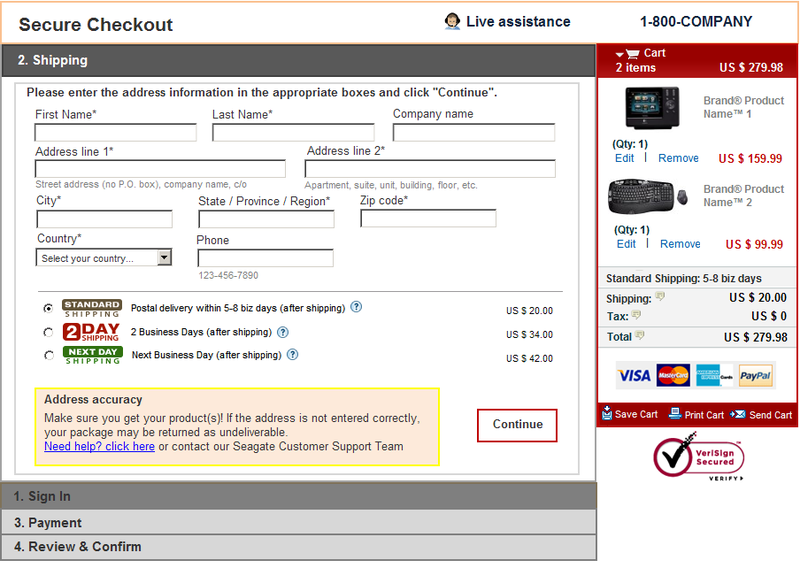 Do you have the critical offer elements such as “Free Shipping”, “Satisfaction guarantee”, “Secured transactions”? D) Demystify your body copy: do you need to reduce or add more details to your page? Is prose better than bulleted points for your visitor type? Which order of text bullets is the best combination? – Where am I? – (1/20 second to first seconds). 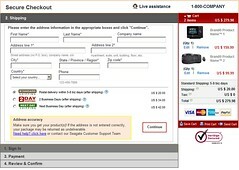 65% shopping cart abandonment rate w/ an average cart value of $109. This practical presentation is the one-stop-shop guide with data, best practices and latest trends in Checkout Flow Optimization. – Supposedly good ideas, think twice! Up to 8 seconds & 15 words to convince visitors. This is a comprehensive research with data, best practices and latest trends in Landing Page Optimization. 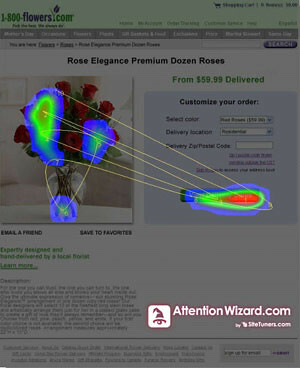 AttentionWizard.com by SiteTuners.com is a predicting software that simulates human visual processing to your Web page by creating a heatmap to eliminate any likelihood of site flow disruption. This week after the Affiliate Summit in NYC, Tim Ash from SiteTuners.com strongly promoted at SES San Jose his brand new TERRIFIC project for e-marketers called Attentionwizard.com. Probably based on the Fen-Gui’s technology, the software is using best-in-class landing page practices (thanks to programmed “artificial intelligence algorithms”!) to simulate human visual processing and show a heat map study of your own landing pages. You just have to upload a screenshot or mockup landing page image and you get instant feedback about fine tuning your design! Tim Ash's Landing Page Bible!